New mix of "The Rain Song" from the upcoming reissue. This has always been one of my favorite Zeppelin songs. You can hear more of what's in the song. The drums sound more up front on this mix. Alternate mix of Stairway. There are small guitar parts more upfront than on the regular version. For the Physical Graffiti reissue, they should have a DVD of one of the Earl's Court shows. Wondering the same thing. I really like the reissues with the bonus material. What do you mean they're useless? I guess I was just hoping for more. Some of those rough mixes on II and III seemed like filler. Like Living Loving Maid without vocals or the lead guitar. What was the point of including that? That's not to say there isn't stuff I enjoyed. Gallows Pole was cool stripped of overdubs. I dunno. Maybe I was being a curmudgeon by calling the bonus discs useless (I'm in the middle of moving and I'm stressed) The more Zeppelin the better right? They are useless and lets be real just another $ grab!!! And yet I've bought them all and the remastered studio albums sound awesome but, the bonus disc's are worthless except LZ1 and the live Paris show! Every album should've had a live show from that album's tour since they have nothing new/unreleased left to put on the bonus disc's! I could care less about different mixes of the same songs! I was thinking they should've included a LIVE show too from that albums tour. I like it! Of course live shows for all of them would be way better. That's a given. But i still enjoy the demos, etc. But, their not demos! Demos are what Pete Townshend did and then brought to the Who and that is brilliant and completely different then the final versions of what the Who did with his demos!!! These are just alternate takes of the same songs w/ very little variation! Who is Page kidding w/ this BS? They obviously have nothing in their vaults and they are just raking their fans over the coals and it works every time! Again a live disc from that album's tour was the only way to go! Whatever you want to call them (some of them actually are demos, some aren't - I wasn't meaning to be specific), i still enjoy the bonus material. Listened to it all, and had fun doing it. I wasn't expecting ANY live concerts actually, so when i found out the first record had one i was pleasantly surprised. Page never said these would all come with live shows, so i don't think he's kidding anyone. I found him to be very forthright about what would be there, and we got what he said we'd get. You actually seem offended by the bonus material, lol! They did make the remasters available just as single LPs too you know, without the bonus stuff. Sounds like you should have gone that way! I'm not saying or ever have said that we as fans were deceived or that Page said something other then what we got which, was still nothing! And that's the point and the BS that I speak of, they(Page) gave us nothing and if they knew they had nothing to offer then, they should've given the fans a live disc of that album's tour! It's really not that difficult to understand but, if your happy with a different tone on a guitar part or a lower amount of reverb on another and that qualifies a reason to call it a bonus disc then I'm happy for you! The bottom line is they know fans will pay for this stuff and they probably didn't want to include live material because I'm sure that will be coming down the line as another cash grab when Page is 80! 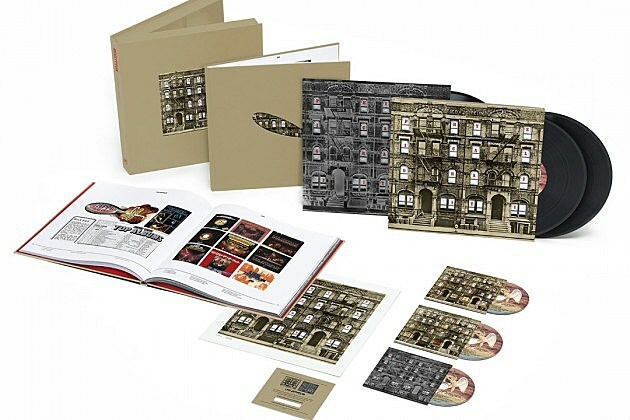 this 3LP version is a lot more than the Led Zep I reissue. I think I got it for $35. I'll get another copy of this. Still my favorite Zeppelin album! this 3LP version is a lot more than the Led Zep I reissue. I think I got for $35. Pre-order at Soundstage Direct $56 for the Deluxe edition. $38 for the regular version. Thanks, I saw that. I paid $35 for the 3-LP deluxe Led Zep I from Pop-Market and that had a live show. Yeah, I got the first 3 deluxe editions from Pop Market with a discount code for $92. Just snagged IV and Houses of the Holy LP reissues for $5 each. Was shocked to see them in pre-owned bin! I guess someone who hates Led Zep got them for Christmas, lol. $56 seems like way too much for just the one album. I got all 3 deluxe editions (I, II, III) for $102 CAD from Amazon.ca. $56 for 3LPs is about standard pricing these days. Sure, but I just didn't think it was this much for this particular one is all .... I mean, it wasn't when I bought it. I can't wait to see Robert Plant live in July. Never seen him before. Wonder if he does any Led Zep? I sure hope so.